Britvic has confirmed it will leave its Norwich site, with the loss of hundreds of jobs in the city, in 2019. The Unite union said the announcement just before Christmas was a bid to "bury bad news". Britvic said it currently employed 249 people at the site, which it shares with Colman's Mustard. Manufacturing will instead take place at Rugby, east London and Leeds. "Transferring production will improve efficiency and productivity and reduce our environmental impact," the company said. The decision follows a consultation with employee representatives, including the GMB and Unite unions. Chief executive Simon Litherland said: "This was not a proposal that we made lightly and we understand that the outcome of the collective consultation process will be upsetting for our colleagues in Norwich. "It is a sad and difficult time. "I want to thank everyone at Norwich, past and present, for their dedication, hard work and commitment, and I would like to say again that this decision is in no way a reflection of their performance." The Unite union criticised the timing of the announcement and described the closure as "a hammer blow for the workers and the economy of Norwich in the run up Christmas". Its national officer for the food and drink sector, Julia Long, branded the announcement as "a classic case of trying to bury bad news". The move by Britvic has been mooted for several months, with fears expressed for the future of Colman's Mustard, which has been manufactured at the site since 1860. 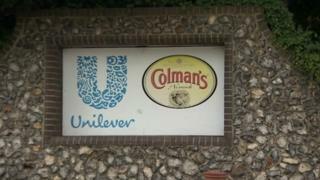 Unilever, which owns Colman's, has previously said it could shut the site if Britvic closed operations. It is conducting its own review and is looking at three sites in the city, including staying at Carrow Works. Unilever has been approached for comment.